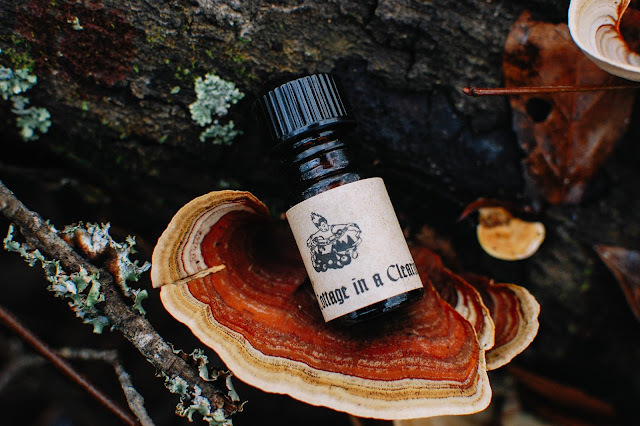 Some Arcana Wildcraft perfume oils featured today, for your viewing please. Even though Julia's eBay shop is closed at the moment, some of these can be purchased at Nui Cobalt Designs or in the new Arcana Buy/Sell/Trade Facebook group. 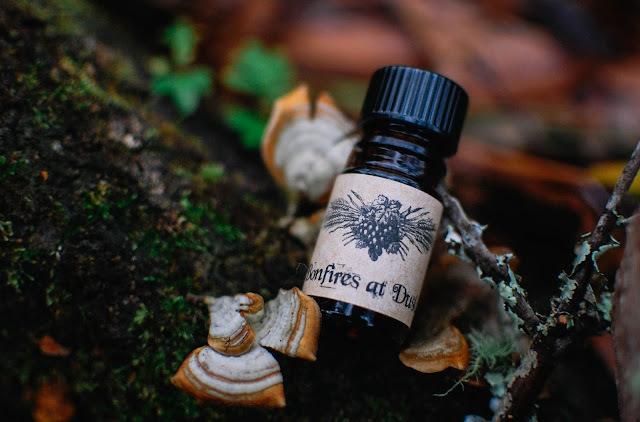 Bonfires At Dusk- Notes: Woodsmoke, sweet beeswax, Oregon lavender, sandalwood, charred juniper and the scent of swiftly appearing stars. 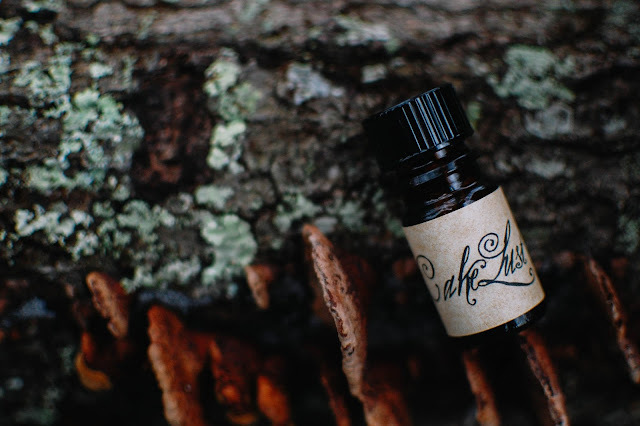 From the dark bottle, sweet herbal lavender and prickly green juniper and woods germinate and grow. Moistened onto the skin, stalks of lavender and green herbs gather in bundles, freshly tied with twine, a bouquet garni hanging from an oak branch. The tree acts as sentinel to an old A-frame house that nestles in a copse of deciduous trees. Half burned candles line the porch railing, their wax crying tears down the pillars and onto the uneven wooden planks making honeyed pools of sticky sorrow. As the sun sets and the stars poke through the violet velvet sky, the small backyard leaf pile is set ablaze and sends smoke ghosts out to the surrounding woods to watch and lurk. One heads for the oak in the front yard and wraps its tendril fingers around the tied lavender bundle, it grasps, smudges, blurs the lavender into a silhouette. A shadow against the taupe night sky. The soft smoke ends with a muted honey sweetness in the deep drydown. If you love smoky lavender, this is a must. 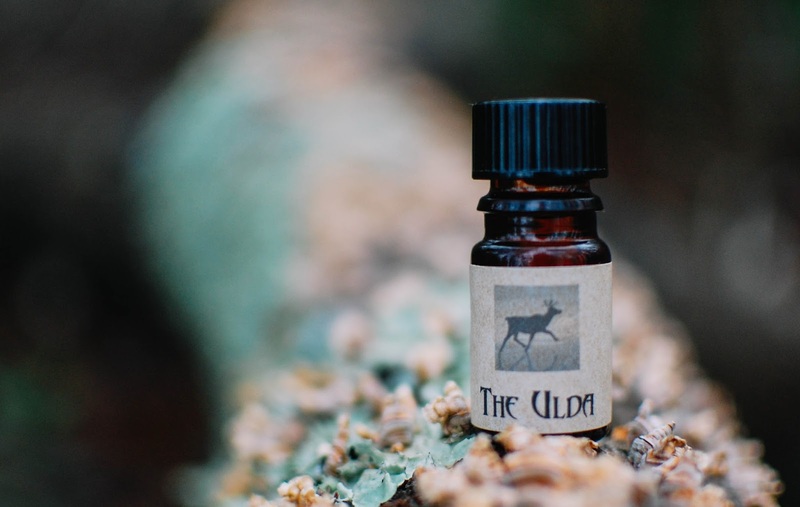 The Ulda- Notes: The elusive fairy folk of the Nordic Sapmi region are said to live underneath the Earth and travel in reindeer-drawn sleighs tinkling with silver bells. White almond, resinous Baltic amber, crisp bayberry, warm cardamom and pink pepper. Sweet almond and the softly bitter evergreen-like essence of bayberry greet the nose from the vial. Daubed onto the skin the bayberry feels wild and a touch feral. Cardamom warms up the fragrance and the almond adds a gentle nectar. The cardamom evolves to smell like white pepper infused with a whiff of peat smoke and a morsel of frankincense resin. Unique among my collection, this one is sadly discontinued but you might still find one being destashed somewhere. Cake Lust- Notes: Golden bakery cakes spiked with blonde tobacco, Balsam of Peru, cardamom and mace. Island rum cakes dripping with honey and thin transparent dribbling tear drops of caramel served in a quaint Cuban cafe waft up the street while the scent of raw and sweet tobacco leaves floats in from the tobacconist shop next door, this is the aroma that ascends from the bottle. It almost has a caramelized banana richness to it. Drizzled on the tender skin of the inner forearms, the same sweet cakes and dulce de leche aroma fill the nose. Slowly the snug scent of mace warms up the perfume like a velvety cinnamon stick. This mild and mellow spice transitions the cake into vanilla tobacco, flawlessly. Here, on my skin, the drydown remains that softly spiced and deeply caramelized vanilla tobacco. Golden and balmy. This is one I would love to have in a 15ml. I bet it gets even better with age and it is pretty damn good right now. Small Cottage in a Clearing- Notes: The cozy scent of milky coffee with white sugar, cinnamon, ginger, allspice and a faint undercurrent of dangerous black musk. This smells of the loving gift my husband brings me every morning as I get ready for the day. The warm mug of roasted and almost chocolatey bold coffee, a touch bitter, tempered with sweet cream. This treasured moment is encapsulated right in the bottle and greets me like an old friend upon opening. The very same dark, full bodied roast of brew dwells on the skin once applied. It almost smolders in its smoky warmth and darkness. As it ages on the skin the teaspoon of sugar and glug of milk dissipates and that black musk strengthens the morning drug and transforms it into a rippling pool of blackest coffee. This makes for a warming winter scent. I get so lost with imagination in your descriptions 💙 so sad she is closing... would it be so crazy if you and I bought one of everything before she officially closes her doors? She has not said she is closing. Her eBay store is just closed for right now. Thank you for the compliment. I do have a few more I would like to try... like the banana scent. 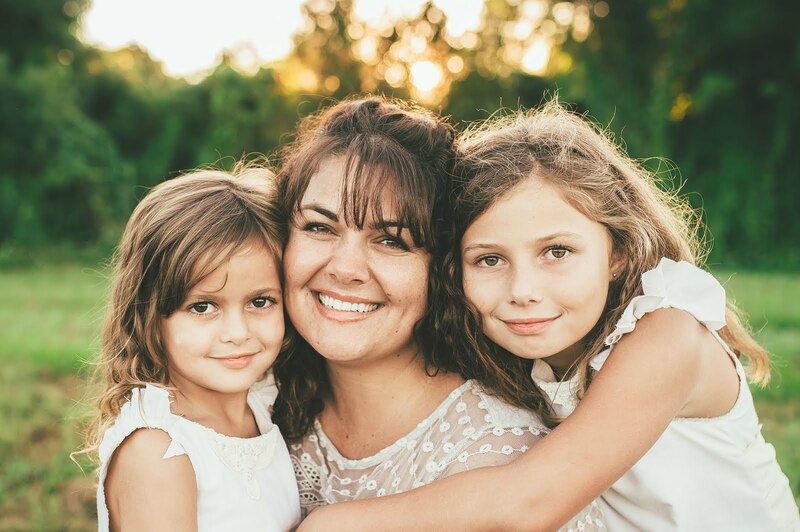 Thank you Doreen!! I hope you have been well my friend.